The Coast Guard is investigating a possible hoax call after multiple Coast Guard assets and partner agencies responded to a distress call that was made via VHF-FM channel 16, Sunday at approximately 2:45 a.m. near Beaufort, N.C. As part of this investigation, the Coast Guard is seeking the public’s assistance to identify the caller or provide additional information. 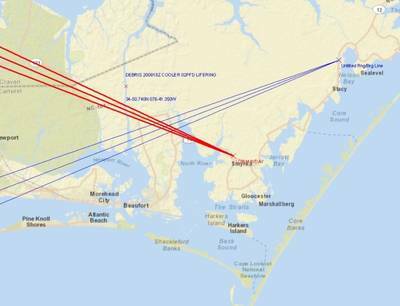 Coast Guard Sector North Carolina Command Center watchstanders received a mayday call Sunday via VHF- Channel 16. The boater in distress reported he had five adults and two children on his vessel that was taking on water in the vicinity of the Core Creek Bridge. The watchstanders issued an urgent marine information broadcast and launched a crew aboard a 24-foot Special Purpose Craft-Shallow Water from Coast Guard Station Fort Macon, N.C. In addition, a CH-43 helicopter from Marine Corps Air Station Cherry Point Emergency Rescue Squadron "PEDRO," Towboat U.S., and Atlantic Beach and Morehead City Fire Department personnel assisted in the search. "False distress calls limit the Coast Guard's ability to respond to actual emergencies," said Cmdr. Joseph Dufresne, deputy commander of Sector North Carolina. "Ultimately, they penalize the local communities and mariners the Coast Guard is charged to protect by unnecessarily endangering the lives of responders and wasting hundreds of thousands of tax payer dollars." Under federal law, knowingly and willfully transmitting a hoax distress call is a felony. It is punishable by up to six years in prison, a $250,000 fine and restitution to the Coast Guard for the cost of performing the search. The Coast Guard Investigative Service is offering a reward of up to $2,000 for the positive identification of the person invovled with the hoax call. The Coast Guard requests anyone who recognizes the voice in the mayday calls or has any information pertaining to the possible hoax call to contact the CGIS Resident Agent Office, Wilmington, N.C. at 910-772-2229, or the Sector North Carolina Operations Center at 910-343-3881. 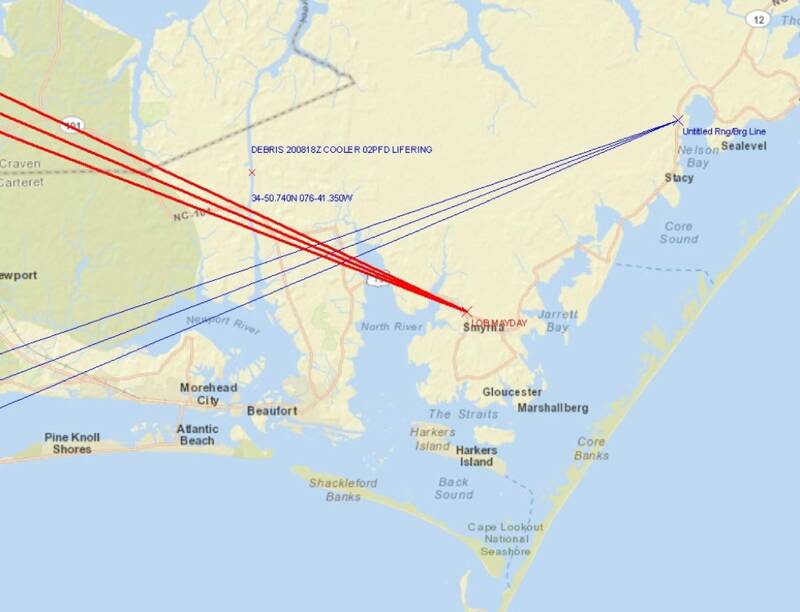 The graphic pictured here shows the intersecting lines of bearing were the Coast Guard's search and rescue radio towers approximated the location of the distress broadcast. The small x in the top left corner is where the distressed boater reported being.